Do you position yourself as an expert, as the go-to person for who you coach, what you coach on or how you coach? I sure hope you answered “Yes,” or at least, “I’m just starting out and am on the mastery path to achieve expertise,” because expert positioning is key to your business success. And after more than a decade of helping coaches build successful and profitable coaching businesses, this is one of the BIG areas where I see a lot of people get all tripped up. Here’s the deal… when you position yourself as an expert coach it’s easier to attract serious clients, generate more referrals, charge higher fees, fill your group programs and grow your list of followers and fans. On a scale of 1-5, how are you doing with your expert positioning? 1 = I’m a brand new coach or I haven’t identified an area of expertise. 3 = I have an area of focus and I’m good at what I do, but I’m not ready to call myself an expert. 5 = I embrace expert positioning, even when it’s not 100% comfortable. If you’re not at a 5, what do you need to do to get there? In my experience, an excellent first step is to claim it. You can’t wait for someone to declare that you are an expert at XYZ. Instead, look inside, ask yourself if you have an important gift or message for the world and then decide that you are (or will become) an expert and start sharing it. Your experience and perspective can help new clients gain clarity and focus. Don’t hold back your wisdom. People are confused and overwhelmed. They want a clear plan or blueprint that they can follow. If you have what people want and need don’t hold back. Even though I may not know you personally, I bet you could be making a bigger difference and impact if you put aside whatever fears or concerns you might have about not having or being enough, stopped comparing yourself to others and really connected with all you truly have to offer and boldly put it out in the world. Does that strike a chord? Am I totally off-base? 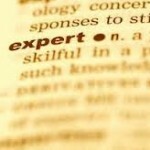 Are you unclear about how you can be both be an expert” and a “real coach”? This is an important topic so please post your thoughts, comments and questions below or on our Facebook page and let me know!